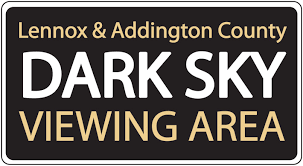 Lennox and Addington County’s Dark Sky Viewing Area will host its final event of the season this Friday and Saturday with ‘Almost Autumn’ stargazing. Expert night sky photographer Joe Gilker will return to lead guests in a laser-guided tour and offer looks through his high-powered telescope at areas of interest that include the Andromeda Galaxy, the Ring Nebula and Mars, all of which are in good viewing position this time of year. As always the event, which is free admission, will be largely dependant on weather. It will only go ahead if the night sky is mostly clear of cloud cover. Guests are encouraged to check www.darkskyviewing.com or www.facebook.com/darkskyviewing for up to the minute viewing conditions before leaving home. They’re also encouraged to bring a lawn chair, binoculars if they have them and to dress warmly. Both Friday and Saturday’s events will get underway at approximately 8:30 p.m. as the sky gets dark enough for optimal viewing. This event will wrap up a successful 2018 season at the DSVA, which again attracted hundreds of guests throughout the summer who were seeking a place to view the night sky free of the light pollution of major metropolises. Although this will be the final formal event of the season, the DSVA will remain open year-round, free to the public. The DSVA is located 37 KM north of Napanee bear the Sheffield Conservation Area at 7980 County Rd. 41. Along with unobstructed views of the sky, it also features a large concrete pad which is ideal for setting up a camera or telescope.